Washington. D.C., August 24, 2009 Aaron S. Williams was sworn in Monday as the eighteenth Director of the Peace Corps. 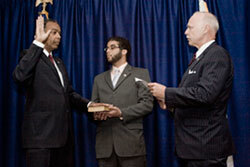 Director Williams was nominated by President Obama on July 14 and confirmed by the U.S. Senate on August 7. I am deeply honored to be the Director of the Peace Corps and I want to thank President Obama for the trust that he has placed in me. I look forward to making his call to public service a reality for more Americans, said Director Williams. I am committed to recruiting, training, and supporting the next generation of skilled and enthusiastic volunteers eager to serve side by side with members of Peace Corps host communities around the world. Mr. Williams is the fourth director to have served as a Peace Corps volunteer. He served as a volunteer in the Dominican Republic from 1967 to 1970. Upon completing his service, he became the coordinator of minority recruitment and project evaluation officer for the Peace Corps in his hometown of Chicago from 1970 to 1971. As USAID Mission Director in South Africa, Mr. Williams led a billion dollar foreign assistance program during President Nelson Mandelas administration. In addition, he has extensive experience in the design and management of assistance programs in Latin America, Africa, Asia, and the Middle East. He was awarded the USAID Distinguished Career Service Award, and was twice awarded the Presidential Award for Distinguished Service. As the agency approaches its 50th anniversary, the Peace Corps continues to promote peace and friendship around the world. Today, nearly 7,500 Peace Corps volunteers in 74 countries work in a variety of areas including education, public health, business and information technology, environment, agriculture and youth and community development. Since 1961, nearly 200,000 Americans have joined the Peace Corps in order to help promote a better understanding between Americans and the people of the 139 countries in which they have served.